Determination of the effective density of suspended nanoparticles and microparticles by means of special sedimentation analysis methods. 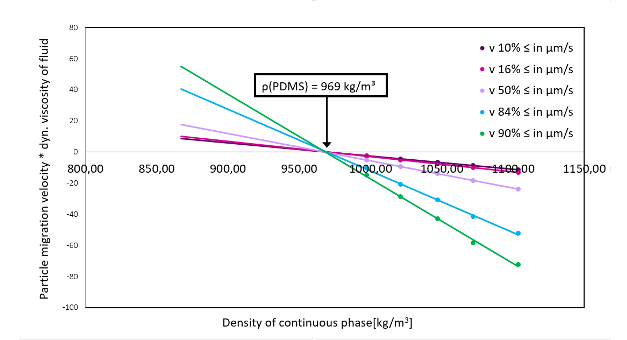 Determination of the particle migration rate in continuous phases with different densities. In the suspended state, the particle density corresponds exactly to the density of the liquid suspension medium (Archimedes principle). The particles are dispersed in different solutions with densities close to and below the expected particle density, and the direction and magnitude of the velocity of the moving particles are determined. The effective particle density is determined by interpolation of the liquid density to the particle velocity zero. The mean effective particle density is calculated from the experimentally determined separation rates of the particles dispersed in two or more liquids with different density (e.g., H2O, D2O, and mixtures of both) using the Stokes equation. Particle form (Powdershape®) in powders and suspensions with typical particle sizes from 1 µm to 3000 µm. Forms are described using geometric macroform descriptors according to ISO 9276-6:2008. According to the principle of Hansen - Solubility - Parameter (HSP) the parameters δD - Dispersion, δP - Polarity und δH - Hydrogen bonding for dispersed particles are determined. Test solvents are used from the 3D Hansen Space as continuous phases in which the particles are dispersed. The separation kinetics of the particles in each test liquid in LUMiSizer® bzw. LUMiReader® PSA are determined. From these data, the normalization of the sedimentation times of the particles for each test phase is based on the integral extinktion. 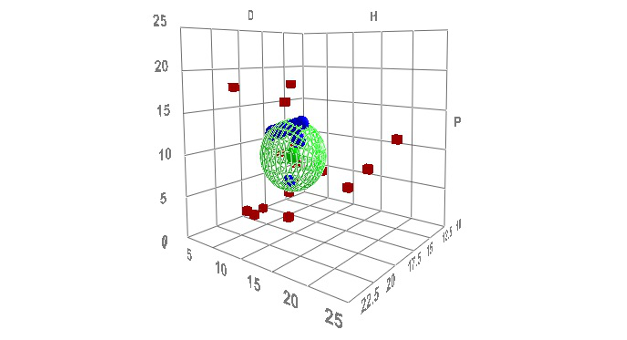 The evaluation and classification of the values obtained and the calculation of the HSPs of the particles is carried out with the HSPiP-software.